KIEV, Ukraine -- An ally of Ukraine's president has been accused by a former Ukrainian prosecutor of interfering in law enforcement. A woman walks past the parliament building in Kiev. A representative of Ihor Kononenko, a business partner of President Petro Poroshenko and member of parliament of his political party, declined to comment on the allegation, made in a Reuters interview by ex-prosecutor Vitaliy Kasko. The representative, Taras Pastushenko, the spokesman for Poroshenko's party in parliament, cited an ongoing investigation into separate allegations by the economy minister as the reason why Kononenko would not comment. Corruption allegations are particularly sensitive in Ukraine, where a $40 billion Western aid program is propping up an economy devastated by Russia's annexation of Crimea and support for rebels in the former Soviet republic's east. Kasko resigned as prosecutor last week alleging corruption in the prosecution service. Asked to explain his decision, Kasko said in the interview one example was that the head of the service, General Prosecutor Viktor Shokin, had told him Kononenko had asked the service to influence a prosecution. As a politician, Kononenko has no official role in the service. Kasko said Shokin had given him instructions, which Shokin had said came from Kononenko, to intervene in the case. "I received a firm request from the General Prosecutor in reference to this," Kasko said, declining to give details of the case. "I refused to carry it out. I didn't do as I was told." Shokin's office declined to comment on whether Shokin had asked Kasko to handle a case in a particular way to suit Kononenko. Shokin aide Vladislav Kutsenko had earlier described Kasko's resignation and general corruption allegation as attention-seeking. "The General Prosecutor's Office has become the subject of an information war carried out by the representatives of some politicians, public organizations, who ... for the most part just attack us with the usual lies," Kutsenko said in relation to Kasko's resignation and allegations. On Friday, President Poroshenko's spokesman said Shokin had resigned, but he remains in office pending confirmation of his resignation by parliament. Attempts to reach Shokin were unsuccessful. His office said he was on holiday and did not pass on contact details. The prosecution service is one of the institutions the Ukrainian government needs to reform under the terms of the aid program and lenders have long said progress has been slow. Poroshenko, a multi-millionaire businessman, was elected in 2014 after Ukraine's Russian-backed president fled in the face of mass protests. He and Kononenko served together in the Soviet army in the 1980s and worked in Ukrprominvest, a onetime business group that Poroshenko controlled. Between them they now they own most of Ukraine's International Investment Bank. 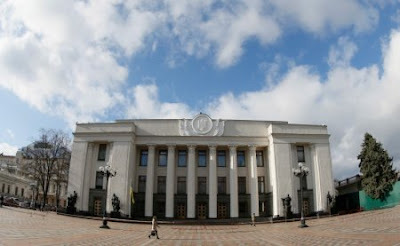 Kononenko resigned as deputy leader of the president's party in parliament after the minister's allegations, but remained a lawmaker. His office referred questions to his political party, which said he would not comment pending the investigation by the National Anti-Corruption Bureau of Ukraine (NABU). Petro Poroshenko's Bloc, in the parliament. In response to questions about Kononenko's alleged influence, the president's office referred to two statements Poroshenko made after the allegations by Economy Minister Aivaras Abromavicius in a resignation letter on Feb. 3. His resignation has yet to be considered by parliament. The first presidential statement noted the minister's allegations were being investigated and Kononenko was cooperating. "The sooner society receives an answer to the question, the better," Poroshenko had said on Feb. 3. The other statement, on Feb. 9, also referred to the anti-corruption bureau's investigation but did not mention any individuals. "Nobody is safe from the Bureau's attention and any networking will not provide indulgence or protection," it said.